This article is about the U.S. city. For the county in California, see Los Angeles County, California. For other uses, see Los Angeles (disambiguation). "LA" and "L.A." redirect here. For U.S. state with the postal abbreviation LA, see Louisiana. For other uses, see L.A. (disambiguation). Los Angeles (/lɔːs ˈændʒələs/ ( listen);[a] Spanish: Los Ángeles), officially the City of Los Angeles and often known by its initials L.A., is the most populous city in California, the second most populous city in the United States, after New York City, and the third most populous city in North America. With an estimated population of four million, Los Angeles is the cultural, financial, and commercial center of Southern California. The city is known for its Mediterranean climate, ethnic diversity, Hollywood and the entertainment industry, and its sprawling metropolis. Los Angeles is the largest city on the West Coast of North America. Los Angeles is in a large basin bounded by the Pacific Ocean on one side and by mountains as high as 10,000 feet (3,000 m) on the other. 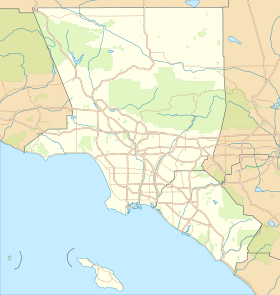 The city proper, which covers about 469 square miles (1,210 km2), is the seat of Los Angeles County, the most populated county in the country. Los Angeles is also the principal city of the Los Angeles metropolitan area, the second largest in the United States after that of New York City, with a population of 13.1 million. It is part of the Los Angeles-Long Beach combined statistical area, also the nation's second most populous area with a 2015 estimated population of 18.7 million. Los Angeles is one of the most substantial economic engines within the United States, with a diverse economy in a broad range of professional and cultural fields. Los Angeles is also famous as the home of Hollywood, a major center of the world entertainment industry. A global city, it has been ranked 6th in the Global Cities Index and 9th in the Global Economic Power Index. The Los Angeles metropolitan area also has a gross metropolitan product of $1.044 trillion (as of 2017[update]), making it the third-largest in the world, after the Tokyo and New York metropolitan areas. Los Angeles hosted the 1932 and 1984 Summer Olympics and will host the event for a third time in 2028. The city also hosted the Miss Universe pageant twice, in 1990 and 2006, and was one of 9 American cities to host the 1994 FIFA men's soccer World Cup and one of 8 to host the 1999 FIFA women's soccer World Cup, hosting the final match for both tournaments. Historically home to the Chumash and Tongva, Los Angeles was claimed by Juan Rodríguez Cabrillo for Spain in 1542 along with the rest of what would become Alta California. The city was officially founded on September 4, 1781, by Spanish governor Felipe de Neve. It became a part of Mexico in 1821 following the Mexican War of Independence. In 1848, at the end of the Mexican–American War, Los Angeles and the rest of California were purchased as part of the Treaty of Guadalupe Hidalgo, becoming part of the United States. Los Angeles was incorporated as a municipality on April 4, 1850, five months before California achieved statehood. The discovery of oil in the 1890s brought rapid growth to the city. The completion of the Los Angeles Aqueduct in 1913, delivering water from Eastern California, later assured the city's continued rapid growth. The Los Angeles coastal area was settled by the Tongva (Gabrieleños) and Chumash tribes. A Gabrieleño settlement in the area was called iyáangẚ (written Yang-na by the Spanish), meaning "poison oak place". Maritime explorer Juan Rodríguez Cabrillo claimed the area of southern California for the Spanish Empire in 1542 while on an official military exploring expedition moving north along the Pacific coast from earlier colonizing bases of New Spain in Central and South America. Gaspar de Portolà and Franciscan missionary Juan Crespí, reached the present site of Los Angeles on August 2, 1769. In 1771, Franciscan friar Junípero Serra directed the building of the Mission San Gabriel Arcángel, the first mission in the area. On September 4, 1781, a group of forty-four settlers known as "Los Pobladores" founded the pueblo they called El Pueblo de Nuestra Señora la Reina de los Ángeles, 'The Town of Our Lady the Queen of the Angels'. [b] The present-day city has the largest Roman Catholic Archdiocese in the United States. Two-thirds of the Mexican or (New Spain) settlers were mestizo or mulatto, a mixture of African, indigenous and European ancestry. The settlement remained a small ranch town for decades, but by 1820, the population had increased to about 650 residents. Today, the pueblo is commemorated in the historic district of Los Angeles Pueblo Plaza and Olvera Street, the oldest part of Los Angeles. New Spain achieved its independence from the Spanish Empire in 1821, and the pueblo continued as a part of Mexico. During Mexican rule, Governor Pío Pico made Los Angeles Alta California's regional capital. Mexican rule ended during the Mexican–American War: Americans took control from the Californios after a series of battles, culminating with the signing of the Treaty of Cahuenga on January 13, 1847. Railroads arrived with the completion of the transcontinental Southern Pacific line to Los Angeles in 1876 and the Santa Fe Railroad in 1885. Petroleum was discovered in the city and surrounding area in 1892, and by 1923, the discoveries had helped California become the country's largest oil producer, accounting for about one-quarter of the world's petroleum output. By 1900, the population had grown to more than 102,000, putting pressure on the city's water supply. The completion of the Los Angeles Aqueduct in 1913, under the supervision of William Mulholland, assured the continued growth of the city. Due to clauses in the city's charter that effectively prevented the City of Los Angeles from selling or providing water from the aqueduct to any area outside its borders, many adjacent city and communities became compelled to annex themselves into Los Angeles. Los Angeles created the first municipal zoning ordinance in the United States. On September 14, 1908, the Los Angeles City Council promulgated residential and industrial land use zones. The new ordinance established three residential zones of a single type, where industrial uses were prohibited. The proscriptions included barns, lumber yards, and any industrial land use employing machine-powered equipment. These laws were enforced against industrial properties after-the-fact. These prohibitions were in addition to existing activities which were already regulated as nuisances. These included explosives warehousing, gas works, oil-drilling, slaughterhouses, and tanneries. Los Angeles City Council also designated seven industrial zones within the city. However, between 1908 and 1915, Los Angeles City Council created various exceptions to the broad proscriptions which applied to these three residential zones, and as a consequence, some industrial uses emerged within them. There are two differences from the 1908 Residence District Ordinance and later zoning laws in the United States. First, the 1908 laws did not establish a comprehensive zoning map as the 1916 New York City Zoning Ordinance did. Second, the residential zones did not distinguish types of housing; it treated apartments, hotels, and detached-single-family housing equally. In 1910, Hollywood merged into Los Angeles, with 10 movie companies already operating in the city at the time. By 1921, more than 80 percent of the world's film industry was concentrated in LA. The money generated by the industry kept the city insulated from much of the economic loss suffered by the rest of the country during the Great Depression. By 1930, the population surpassed one million. In 1932, the city hosted the Summer Olympics. During World War II, Los Angeles was a major center of wartime manufacturing, such as shipbuilding and aircraft. Calship built hundreds of Liberty Ships and Victory Ships on Terminal Island, and the Los Angeles area was the headquarters of six of the country's major aircraft manufacturers (Douglas Aircraft Company, Hughes Aircraft, Lockheed, North American Aviation, Northrop Corporation, and Vultee). During the war, more aircraft were produced in one year than in all the pre-war years since the Wright brothers flew the first airplane in 1903, combined. Manufacturing in Los Angeles skyrocketed, and as William S. Knudsen, of the National Defense Advisory Commission put it, "We won because we smothered the enemy in an avalanche of production, the like of which he had never seen, nor dreamed possible." Following the end of World War II, Los Angeles grew more rapidly than ever, sprawling into the San Fernando Valley. The expansion of the Interstate Highway System during the 1950s and 1960s helped propel suburban growth and signaled the demise of the city's electrified rail system, once the world's largest. The 1960s saw race relations boil over into the Watts riots of 1965 which resulted in 34 deaths and over 1,000 injuries. In 1969, Los Angeles became the birthplace of the Internet, as the first ARPANET transmission was sent from the University of California, Los Angeles (UCLA) to SRI in Menlo Park. In 1973, Thomas Bradley was elected as the city's first African American mayor, serving for five terms until retiring in 1993. Other events in the city during the 1970's included the Symbionese Liberation Army's South Central standoff in 1974, the Hillside Stranglers murder cases in 1977-1978, Daryl Gates becoming Los Angeles Police Department's 49th-and as controversially outspoken as his predecessor Edward Davis-police chief in 1978 and also in 1978 the 50th Academy Awards ceremony at the city's Dorothy Chandler Pavilion and Jimmy Carter's first ever presidential visit and in 1979, the decade ending with the 50th anniversary of the Academy Awards (51st ever ceremony, also at the Dorothy Chandler Pavilion), President Carter's second visit to the city and the City Council's and Bradley's respective passing and signing of the city's first homosexual rights bill. In 1984, the city hosted the Summer Olympic Games for the second time. Despite being boycotted by 14 Communist countries, the 1984 Olympics became more financially successful than any previous, and the second Olympics to turn a profit until then–the other, according to an analysis of contemporary newspaper reports, being the 1932 Summer Olympics, also held in Los Angeles. Racial tensions erupted on April 29, 1992, with the acquittal by a Simi Valley jury of four Los Angeles Police Department (LAPD) officers captured on videotape beating Rodney King, culminating in large-scale riots. In 1994, the 6.7 Northridge earthquake shook the city, causing $12.5 billion in damage and 72 deaths. The century ended with the Rampart scandal, one of the most extensive documented cases of police misconduct in American history. In 2002, voters defeated efforts by the San Fernando Valley and Hollywood to secede from the city. Los Angeles will host the 2028 Summer Olympics and Paralympic Games, making Los Angeles the third city to host the Olympics three times. The city of Los Angeles covers a total area of 502.7 square miles (1,302 km2), comprising 468.7 square miles (1,214 km2) of land and 34.0 square miles (88 km2) of water. The city extends for 44 miles (71 km) longitudinally and for 29 miles (47 km) latitudinally. The perimeter of the city is 342 miles (550 km). Los Angeles is both flat and hilly. The highest point in the city proper is Mount Lukens at 5,074 ft (1,547 m), located at the northeastern end of the San Fernando Valley. The eastern end of the Santa Monica Mountains stretches from Downtown to the Pacific Ocean and separates the Los Angeles Basin from the San Fernando Valley. Other hilly parts of Los Angeles include the Mt. Washington area north of Downtown, eastern parts such as Boyle Heights, the Crenshaw district around the Baldwin Hills, and the San Pedro district. Surrounding the city are much higher mountains. Immediately to the north lie the San Gabriel Mountains, which is a popular recreation area for Angelenos. Its high point is Mount San Antonio, locally known as Mount Baldy, which reaches 10,064 feet (3,068 m). Further afield, the highest point in the Greater Los Angeles area is San Gorgonio Mountain, with a height of 11,503 feet (3,506 m). The Los Angeles River, which is largely seasonal, is the primary drainage channel. It was straightened and lined in 51 miles (82 km) of concrete by the Army Corps of Engineers to act as a flood control channel. The river begins in the Canoga Park district of the city, flows east from the San Fernando Valley along the north edge of the Santa Monica Mountains, and turns south through the city center, flowing to its mouth in the Port of Long Beach at the Pacific Ocean. The smaller Ballona Creek flows into the Santa Monica Bay at Playa del Rey. Los Angeles is rich in native plant species partly because of its diversity of habitats, including beaches, wetlands, and mountains. The most prevalent plant communities are coastal sage scrub, chaparral shrubland, and riparian woodland. Native plants include: the California poppy, matilija poppy, toyon, Ceanothus, Chamise, Coast Live Oak, sycamore, willow and Giant Wildrye. Many of these native species, such as the Los Angeles sunflower, have become so rare as to be considered endangered. Although it is not native to the area, the official tree of Los Angeles is the Coral Tree (Erythrina caffra) and the official flower of Los Angeles is the Bird of Paradise (Strelitzia reginae). Mexican Fan Palms, Canary Island Palms, Queen Palms, Date Palms, and California Fan Palms are common in the Los Angeles area, although only the last is native. Los Angeles is subject to earthquakes because of its location on the Pacific Ring of Fire. The geologic instability has produced numerous faults, which cause approximately 10,000 earthquakes annually in Southern California, though most of them are too small to be felt. The strike-slip San Andreas Fault system is at the boundary between the Pacific Plate and the North American Plate, and is vulnerable to the "big one", a potentially large and damaging event after the San Francisco earthquake in 1906. The Los Angeles basin and metropolitan area are also at risk from blind thrust earthquakes. Major earthquakes that have hit the Los Angeles area include the 1933 Long Beach, 1971 San Fernando, 1987 Whittier Narrows, and the 1994 Northridge events. Nevertheless, all but a few are of low intensity and are not felt. The USGS has released the UCERF California earthquake forecast which models earthquake occurrence in California. Parts of the city are also vulnerable to tsunamis; harbor areas were damaged by waves from Aleutian Islands earthquake in 1946, Valdivia earthquake in 1960, Alaska earthquake in 1964, Chile earthquake in 2010 and Japan earthquake and Fukushima nuclear disaster in 2011. Panorama of Los Angeles as viewed from Griffith Observatory. The city is divided into over 80 districts and neighborhoods, some of which were incorporated cities that merged with Los Angeles. These neighborhoods were developed piecemeal, and are well-defined enough that the city has signage marking nearly all of them. The city's street patterns generally follows a grid plan, with uniform block lengths and occasional roads that cut across blocks. However, this is complicated by rugged terrain, which has necessitated having different grids for each of the valleys that Los Angeles covers. Major streets are designed to move large volumes of traffic through many parts of the city, many of which are extremely long; Sepulveda Boulevard is 43 miles (69 km) long, while Foothill Boulevard is over 60 miles (97 km) long, reaching as far east as San Bernardino. Drivers in Los Angeles suffer from one of the worst rush hour periods in the world, according to an annual traffic index by navigation system maker, TomTom. LA drivers spend an additional 92 hours in traffic each year. During the peak rush hour there is 80% congestion, according to the index. The tallest building in the city is the Wilshire Grand Center. Los Angeles is often characterized by the presence of low-rise buildings. Outside of a few centers such as Downtown, Warner Center, Century City, Koreatown, Miracle Mile, Hollywood and Westwood, skyscrapers and high-rise buildings are not common. The few skyscrapers built outside of those areas often stand out above the rest of the surrounding landscape. Most construction is done in separate units, rather than wall-to-wall. That being said, Downtown Los Angeles itself has many buildings over 30 stories, with fourteen over 50 stories, and two over 70 stories. Also, Los Angeles is increasingly becoming a city of apartments rather than single family dwellings, especially in the dense inner city and Westside neighborhoods. Important landmarks in Los Angeles include the Hollywood Sign, Walt Disney Concert Hall, Capitol Records Building, the Cathedral of Our Lady of the Angels, Angels Flight, Grauman's Chinese Theatre, Dolby Theatre, Griffith Observatory, Getty Center, Getty Villa, Stahl House, the Los Angeles Memorial Coliseum, L.A. Live, the Los Angeles County Museum of Art, the Venice Canal Historic District and boardwalk, Theme Building, Bradbury Building, U.S. Bank Tower, Wilshire Grand Center, Hollywood Boulevard, Los Angeles City Hall, Hollywood Bowl, Battleship USS Iowa, Watts Towers, Staples Center, Dodger Stadium, and Olvera Street. Los Angeles has a Mediterranean climate (Köppen Csb on the coast and most of downtown, Csa near the metropolitan region to the west), and receives just enough annual precipitation to avoid semi-arid climate (BSh), making the myth that the city has been built in a desert not be completely incorrect. Los Angeles has plenty of sunshine throughout the year, with an average of only 35 days with measurable precipitation annually. The coastal region around Los Angeles has a climate comparable to coastal areas of southeastern Spain such as Alicante or Elche, in temperature range and variation, in sunshine hours and as well as annual precipitation levels. Temperatures in the coastal basin exceed 90 °F (32 °C) on a dozen or so days in the year, from one day a month in April, May, June and November to three days a month in July, August, October and to five days in September. Temperatures in the San Fernando and San Gabriel Valleys are considerably warmer. Temperatures are subject to substantial daily swings; in inland areas the difference between the average daily low and the average daily high is over 30 °F (17 °C). The average annual temperature of the sea is 63 °F (17 °C), from 58 °F (14 °C) in January to 68 °F (20 °C) in August. Hours of sunshine total more than 3,000 per year, from an average of 7 hours of sunshine per day in December to an average of 12 in July. The Los Angeles area is also subject to phenomena typical of a microclimate, causing extreme variations in temperature in close physical proximity to each other. For example, the average July maximum temperature at the Santa Monica Pier is 75 °F (24 °C) whereas it is 95 °F (35 °C) in Canoga Park. The city, like much of the southern California coast, is subject to a late spring/early summer weather phenomenon called "June Gloom". This involves overcast or foggy skies in the morning which yield to sun by early afternoon. Downtown Los Angeles averages 14.93 in (379 mm) of precipitation annually, mainly occurring between November and March, generally in the form of moderate rain showers, but sometimes as heavy rainfall during winter storms. Rainfall is usually higher in the hills and coastal slopes of the mountains because of orographic uplift. Summer days are usually rainless. Rarely, an incursion of moist air from the south or east can bring brief thunderstorms in late summer, especially to the mountains. The coast gets slightly less rainfall, while the inland and mountain areas get considerably more. Years of average rainfall are rare. The usual pattern is year to year variability, with a short string of dry years of 5–10 in (130–250 mm) rainfall, followed by one or two wet years with more than 20 in (510 mm). Wet years are usually associated with warm water El Niño conditions in the Pacific, dry years with cooler water La Niña episodes. A series of rainy days can bring floods to the lowlands and mudslides to the hills, especially after wildfires have denuded the slopes. Both freezing temperatures and snowfall are extremely rare in the city basin and along the coast, with the last occurrence of a 32 °F (0 °C) reading at the downtown station being January 29, 1979; freezing temperatures occur nearly every year in valley locations while the mountains within city limits typically receive snowfall every winter. The greatest snowfall recorded in downtown Los Angeles was 2.0 inches (5 cm) on January 15, 1932. Whilst the most recent snowfall occurred in February 2019, the first snowfall since 1962. At the official downtown station, the highest recorded temperature is 113 °F (45 °C) on September 27, 2010, while the lowest is 28 °F (−2 °C), on January 4, 1949. During autumn and winter, Santa Ana winds sometimes bring much warmer and drier conditions to Los Angeles, and raise wildfire risk. The city is often covered in smog, as in this December 2005 image. A Gabrielino settlement in the area was called iyáangẚ (written Yang-na by the Spanish), which has been translated as "poison oak place". Yang-na has also been translated as "the valley of smoke". Owing to geography, heavy reliance on automobiles, and the Los Angeles/Long Beach port complex, Los Angeles suffers from air pollution in the form of smog. The Los Angeles Basin and the San Fernando Valley are susceptible to atmospheric inversion, which holds in the exhausts from road vehicles, airplanes, locomotives, shipping, manufacturing, and other sources. The smog season lasts from approximately May to October. While other large cities rely on rain to clear smog, Los Angeles gets only 15 inches (380 mm) of rain each year: pollution accumulates over many consecutive days. Issues of air quality in Los Angeles and other major cities led to the passage of early national environmental legislation, including the Clean Air Act. When the act was passed, California was unable to create a State Implementation Plan that would enable it to meet the new air quality standards, largely because of the level of pollution in Los Angeles generated by older vehicles. More recently, the state of California has led the nation in working to limit pollution by mandating low-emission vehicles. Smog is expected to continue to drop in the coming years because of aggressive steps to reduce it, which include electric and hybrid cars, improvements in mass transit, and other measures. The number of Stage 1 smog alerts in Los Angeles has declined from over 100 per year in the 1970s to almost zero in the new millennium. Despite improvement, the 2006 and 2007 annual reports of the American Lung Association ranked the city as the most polluted in the country with short-term particle pollution and year-round particle pollution. In 2008, the city was ranked the second most polluted and again had the highest year-round particulate pollution. The city met its goal of providing 20 percent of the city's power from renewable sources in 2010. The American Lung Association's 2013 survey ranks the metro area as having the nation's worst smog, and fourth in both short-term and year-round pollution amounts. Los Angeles is also home to the nation's largest urban oil field. There are more than 700 active oil wells within 1,500 feet of homes, churches, schools and hospitals in the city, a situation about which the EPA has voiced serious concerns. The 2010 United States Census reported Los Angeles had a population of 3,792,621. The population density was 8,092.3 people per square mile (2,913.0/km²). The age distribution was 874,525 people (23.1%) under 18, 434,478 people (11.5%) from 18 to 24, 1,209,367 people (31.9%) from 25 to 44, 877,555 people (23.1%) from 45 to 64, and 396,696 people (10.5%) who were 65 or older. The median age was 34.1 years. For every 100 females, there were 99.2 males. For every 100 females age 18 and over, there were 97.6 males. There were 1,413,995 housing units—up from 1,298,350 during 2005–2009—at an average density of 2,812.8 households per square mile (1,086.0/km²), of which 503,863 (38.2%) were owner-occupied, and 814,305 (61.8%) were occupied by renters. The homeowner vacancy rate was 2.1%; the rental vacancy rate was 6.1%. 1,535,444 people (40.5% of the population) lived in owner-occupied housing units and 2,172,576 people (57.3%) lived in rental housing units. Percent of households with incomes above $150k across LA County census tracts. According to the 2010 United States Census, Los Angeles had a median household income of $49,497, with 22.0% of the population living below the federal poverty line. According to the 2010 Census, the racial makeup of Los Angeles included: 1,888,158 Whites (49.8%), 365,118 African Americans (9.6%), 28,215 Native Americans (0.7%), 426,959 Asians (11.3%), 5,577 Pacific Islanders (0.1%), 902,959 from other races (23.8%), and 175,635 (4.6%) from two or more races. Hispanics or Latinos of any race were 1,838,822 persons (48.5%). Los Angeles is home to people from more than 140 countries speaking 224 different identified languages. Ethnic enclaves like Chinatown, Historic Filipinotown, Koreatown, Little Armenia, Little Ethiopia, Tehrangeles, Little Tokyo, Little Bangladesh, and Thai Town provide examples of the polyglot character of Los Angeles. Non-Hispanic whites were 28.7% of the population in 2010, compared to 86.3% in 1940. The majority of the Non-Hispanic white population is living in areas along the Pacific coast as well as in neighborhoods near and on the Santa Monica Mountains from the Pacific Palisades to Los Feliz. Mexican ancestry make up the largest ethnic group of Hispanics at 31.9% of the city's population, followed by those of Salvadoran (6.0%) and Guatemalan (3.6%) heritage. The Hispanic population has a long established Mexican-American and Central American community and is spread well-nigh throughout the entire city of Los Angeles and its metropolitan area. It is most heavily concentrated in regions around Downtown as East Los Angeles, Northeast Los Angeles and Westlake. Furthermore, a vast majority of residents in neighborhoods in eastern South Los Angeles towards Downey are of Hispanic origin. The largest Asian ethnic groups are Filipinos (3.2%) and Koreans (2.9%), which have their own established ethnic enclaves−Koreatown in the Wilshire Center and Historic Filipinotown. Chinese people, which make up 1.8% of Los Angeles's population, reside mostly outside of Los Angeles city limits and rather in the San Gabriel Valley of eastern Los Angeles County, but make a sizable presence in the city, notably in Chinatown. Chinatown and Thaitown are also home to many Thais and Cambodians, which make up 0.3% and 0.1% of Los Angeles's population, respectively. The Japanese comprise 0.9% of LA's population, and have an established Little Tokyo in the city's downtown, and another significant community of Japanese Americans is in the Sawtelle district of West Los Angeles. Vietnamese make up 0.5% of Los Angeles's population. Indians make up 0.9% of the city's population. The Los Angeles metropolitan area is home to a large population of Armenians and Iranians, many of whom live in enclaves like Little Armenia and Tehrangeles. African Americans have been the predominant ethnic group in South Los Angeles, which has emerged as the largest African American community in the western United States since the 1960s. The neighborhoods of South Los Angeles with highest concentration of African Americans include Crenshaw, Baldwin Hills, Leimert Park, Hyde Park, Gramercy Park, Manchester Square and Watts. Apart from South Los Angeles, neighborhoods in the Central region of Los Angeles, as Mid-City and Mid-Wilshire have a moderate concentration of African Americans as well. In 1970, the Census Bureau reported the city's population as 17.9% black, 61.1% non-Hispanic white and 17.1% Hispanic. Cathedral of Our Lady of the Angels is the mother cathedral for the Los Angeles archdiocese. According to a 2014 study by the Pew Research Center, Christianity is the most prevalently practiced religion in Los Angeles (65%). Perhaps owing to the fact of its founding by Franciscan friars of Roman Catholicism, the Roman Catholic Archbishop of Los Angeles leads the largest archdiocese in the country. Cardinal Roger Mahony oversaw construction of the Cathedral of Our Lady of the Angels, which opened in September 2002 in Downtown Los Angeles. Construction of the cathedral marked a coming of age of the city's Catholic, heavily Latino community. There are numerous Catholic churches and parishes throughout Los Angeles. In 2011, the once common, but ultimately lapsed, custom of conducting a procession and Mass in honor of Nuestra Señora de los Ángeles, in commemoration of the founding of the City of Los Angeles in 1781, was revived by the Queen of Angels Foundation and its founder Mark Albert, with the support and approbation of the Archdiocese of Los Angeles as well as several civic leaders. The recently revived custom is a continuation of the original processions and Masses which commenced on the first anniversary of the founding of Los Angeles in 1782 and continued for nearly a century thereafter. With 621,000 Jews in the metropolitan area (490,000 in city proper), the region has the second largest population of Jews in the United States. Many of Los Angeles's Jews now live on the Westside and in the San Fernando Valley, though Boyle Heights and Northwest Los Angeles once had large Jewish populations. Many varieties of Judaism are represented in the area, including Reform, Conservative, Orthodox, and Reconstructionist. The Breed Street Shul in East Los Angeles, built in 1923, was the largest synagogue west of Chicago in its early decades; it is no longer a sacred space and is being converted to a museum and community center. The Kabbalah Centre also has a presence in the city. The International Church of the Foursquare Gospel was founded in Los Angeles by Aimee Semple McPherson in 1923 and remains headquartered there to this day. For many years, the church convened at Angelus Temple, which, when built, was one of the largest churches in the country. Los Angeles has had a rich and influential Protestant tradition. The first Protestant service in Los Angeles was a Methodist meeting held in a private home in 1850 and the oldest Protestant church still operating, First Congregational Church, was founded in 1867. In the early 1900s the Bible Institute Of Los Angeles published the founding documents of the Christian Fundamentalist movement and the Azusa Street Revival launched Pentecostalism. The Metropolitan Community Church also had its origins in the Los Angeles area. Important churches in the city include First Presbyterian Church of Hollywood, Bel Air Presbyterian Church, First African Methodist Episcopal Church of Los Angeles, West Angeles Church of God in Christ, Second Baptist Church, Crenshaw Christian Center, McCarty Memorial Christian Church, and First Congregational Church. The Los Angeles California Temple, the second largest temple operated by The Church of Jesus Christ of Latter-day Saints, is on Santa Monica Boulevard in the Westwood neighborhood of Los Angeles. Dedicated in 1956, it was the first LDS temple built in California and it was the largest in the world when completed. 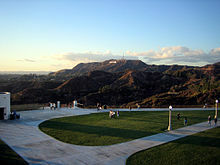 The Hollywood region of Los Angeles also has several significant headquarters, churches, and the Celebrity Center of Scientology. Because of Los Angeles's large multi-ethnic population, a wide variety of faiths are practiced, including Buddhism, Hinduism, Islam, Zoroastrianism, Sikhism, Bahá'í, various Eastern Orthodox churches, Sufism and others. Immigrants from Asia for example, have formed a number of significant Buddhist congregations making the city home to the greatest variety of Buddhists in the world. The first Buddhist joss house was founded in the city in 1875. Atheism and other secular beliefs are also common, as the city is the largest in the Western U.S. Unchurched Belt. The economy of Los Angeles is driven by international trade, entertainment (television, motion pictures, video games, music recording, and production), aerospace, technology, petroleum, fashion, apparel, and tourism. Other significant industries include finance, telecommunications, law, healthcare, and transportation. In the 2017 Global Financial Centres Index, Los Angeles was ranked as having the 19th most competitive financial center in the world, and sixth most competitive in United States (after New York City, San Francisco, Chicago, Boston, and Washington, D.C.). Two of the six major film studios, Paramount Pictures and 20th Century Fox, are within the city limits, their locations being part of the so-called "Thirty-Mile Zone" of entertainment headquarters in Southern California. Los Angeles is the largest manufacturing center in the western United States. The contiguous ports of Los Angeles and Long Beach together comprise the busiest port in the United States by some measures and the fifth-busiest port in the world, vital to trade within the Pacific Rim. The Los Angeles metropolitan area has a gross metropolitan product of $1.044 trillion (as of 2017[update]), making it the third-largest economic metropolitan area in the world, after Tokyo and New York. Los Angeles has been classified an "alpha world city" according to a 2012 study by a group at Loughborough University. The largest employers in the city as of 2009[update] were, in descending order, the City of Los Angeles, the County of Los Angeles, and University of California, Los Angeles. 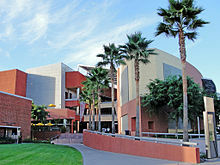 The University of Southern California (USC) is the city's fourth largest employer and the largest private sector employer. As of 2018[update], Los Angeles is home to three Fortune 500 companies: AECOM, CBRE Group, and Reliance Steel & Aluminum Co.
Los Angeles is often billed as the "Creative Capital of the World", because one in every six of its residents works in a creative industry and there are more artists, writers, filmmakers, actors, dancers and musicians living and working in Los Angeles than any other city at any time in history. The city's Hollywood neighborhood has become recognized as the center of the motion picture industry and the Los Angeles area is also associated as being the center of the television industry. The city is home to the major film studios as well as major record labels. Los Angeles plays host to the annual Academy Awards, the Primetime Emmy Awards, the Grammy Awards as well as many other entertainment industry awards shows. Los Angeles is the site of the USC School of Cinematic Arts, the oldest film school in the United States. The performing arts play a major role in Los Angeles's cultural identity. According to the USC Stevens Institute for Innovation, "there are more than 1,100 annual theatrical productions and 21 openings every week." The Los Angeles Music Center is "one of the three largest performing arts centers in the nation", with more than 1.3 million visitors per year. The Walt Disney Concert Hall, centerpiece of the Music Center, is home to the prestigious Los Angeles Philharmonic. Notable organizations such as Center Theatre Group, the Los Angeles Master Chorale, and the Los Angeles Opera are also resident companies of the Music Center. Talent is locally cultivated at premier institutions such as the Colburn School and the USC Thornton School of Music. There are 841 museums and art galleries in Los Angeles County. In fact, Los Angeles has more museums per capita than any other city in the world. Some of the notable museums are the Los Angeles County Museum of Art (the largest art museum in the Western United States), the Getty Center (part of the J. Paul Getty Trust, the world's wealthiest art institution), the Petersen Automotive Museum, the Huntington Library, the Natural History Museum, the Battleship Iowa, and the Museum of Contemporary Art. A significant number of art galleries are on Gallery Row, and tens of thousands attend the monthly Downtown Art Walk there. The city of Los Angeles and its metropolitan area are the home of eleven top level professional sports teams. 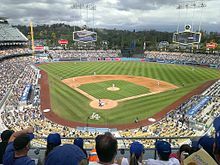 These teams include the Los Angeles Dodgers and Los Angeles Angels of Major League Baseball (MLB), the Los Angeles Rams and Los Angeles Chargers of the National Football League (NFL), the Los Angeles Lakers and Los Angeles Clippers of the National Basketball Association (NBA), the Los Angeles Kings and Anaheim Ducks of the National Hockey League (NHL), the Los Angeles Galaxy and Los Angeles Football Club of Major League Soccer (MLS), and the Los Angeles Sparks of the Women's National Basketball Association (WNBA). Other notable sports teams include the UCLA Bruins and the USC Trojans in the National Collegiate Athletic Association (NCAA), both of which are Division I teams in the Pac-12 Conference. Staples Center is a sports arena, home to the Los Angeles Lakers, Los Angeles Sparks, Los Angeles Clippers, and Los Angeles Kings. Los Angeles is the second-largest city in the United States but hosted no NFL team between 1995 and 2015. At one time, the Los Angeles area hosted two NFL teams: the Rams and the Raiders. Both left the city in 1995, with the Rams moving to St. Louis, and the Raiders moving back to their original home of Oakland. After 21 seasons in St. Louis, on January 12, 2016, the NFL announced the Rams would be moving back to Los Angeles for the 2016 NFL season. A new stadium will be built in Inglewood, California for the team by the 2020 season. Prior to 1995, the Rams played their home games in the Los Angeles Memorial Coliseum from 1946 to 1979 and the Raiders played their home games at the Los Angeles Memorial Coliseum from 1982 to 1994. The San Diego Chargers announced on January 12, 2017 they would relocate to Los Angeles and become the Los Angeles Chargers beginning in the 2017 NFL season and play at Dignity Health Sports Park in Carson, California for the next three seasons until the Rams' Inglewood stadium is completed. Los Angeles has twice hosted the Summer Olympic Games: in 1932 and in 1984, and will host the games for a third time in 2028. Los Angeles will be the third city after London (1908, 1948 and 2012) and Paris (1900, 1924 and 2024) to host the Olympic Games three times. When the tenth Olympic Games were hosted in 1932, the former 10th Street was renamed Olympic Blvd. Super Bowls I and VII were also held in the city, as well as multiple FIFA World Cup games at the Rose Bowl in 1994, including the final. Los Angeles also hosted the Deaflympics in 1985 and Special Olympics World Summer Games in 2015. Los Angeles is a charter city as opposed to a general law city. The current charter was adopted on June 8, 1999 and has been amended many times. The elected government consists of the Los Angeles City Council and the Mayor of Los Angeles which operate under a mayor-council government, as well as the city attorney (not to be confused with the district attorney, a county office) and controller. The mayor is Eric Garcetti. There are 15 city council districts. The city has many departments and appointed officers, including the Los Angeles Police Department (LAPD), the Los Angeles Board of Police Commissioners, the Los Angeles Fire Department (LAFD), the Housing Authority of the City of Los Angeles (HACLA), the Los Angeles Department of Transportation (LADOT), and the Los Angeles Public Library (LAPL). The Charter of the City of Los Angeles ratified by voters in 1999 created a system of advisory neighborhood councils that would represent the diversity of stakeholders, defined as those who live, work or own property in the neighborhood. The neighborhood councils are relatively autonomous and spontaneous in that they identify their own boundaries, establish their own bylaws, and elect their own officers. There are about 90 neighborhood councils. Residents of Los Angeles elect supervisors for the 1st, 2nd, 3rd and 4th supervisorial districts. In the California State Assembly, Los Angeles is split between fourteen districts. In the California State Senate, the city is split between eight districts. In the United States House of Representatives, it is split amongst ten congressional districts. Los Angeles experienced a significant decline in crime in the 1990s and late 2000s and reached a 50-year low in 2009 with 314 homicides. This is a rate of 7.85 per 100,000 population—a major decrease from 1980 when a homicide rate of 34.2 per 100,000 was reported. This included 15 officer-involved shootings. One shooting led to the death of a SWAT team member, Randal Simmons, the first in LAPD's history. 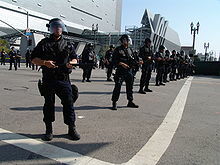 Los Angeles in the year of 2013 totaled 251 murders, a decrease of 16 percent from the previous year. Police speculate the drop resulted from a number of factors, including young people spending more time online. The Dragna crime family and the Cohen crime family dominated organized crime in the city during the Prohibition era and reached its peak during the 1940s and 1950s with the battle of Sunset Strip as part of the American Mafia, but has gradually declined since then with the rise of various black and Hispanic gangs in the late 1960s and early 1970s. According to the Los Angeles Police Department, the city is home to 45,000 gang members, organized into 450 gangs. Among them are the Crips and Bloods, which are both African American street gangs that originated in the South Los Angeles region. Latino street gangs such as the Sureños, a Mexican American street gang, and Mara Salvatrucha, which has mainly members of Salvadoran descent, all originated in Los Angeles. This has led to the city being referred to as the "Gang Capital of America". 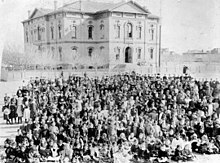 Second branch of the California State Normal School in downtown Los Angeles opened its doors in 1882. There are three public universities within the city limits: California State University, Los Angeles (CSULA), California State University, Northridge (CSUN) and University of California, Los Angeles (UCLA). There are numerous additional colleges and universities outside the city limits in the Greater Los Angeles area, including the Claremont Colleges consortium, which includes the most selective liberal arts colleges in the U.S., and the California Institute of Technology (Caltech), one of the top STEM-focused research institutions in the world. The Los Angeles Central Library is in Downtown Los Angeles. 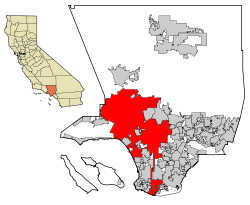 Los Angeles Unified School District serves almost all of the city of Los Angeles, as well as several surrounding communities, with a student population around 800,000. After Proposition 13 was approved in 1978, urban school districts had considerable trouble with funding. LAUSD has become known for its underfunded, overcrowded and poorly maintained campuses, although its 162 Magnet schools help compete with local private schools. Several small sections of Los Angeles are in the Las Virgenes Unified School District. 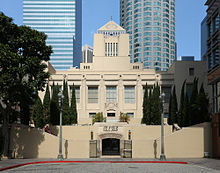 The Los Angeles County Office of Education operates the Los Angeles County High School for the Arts. The Los Angeles Public Library system operates 72 public libraries in the city. Enclaves of unincorporated areas are served by branches of the County of Los Angeles Public Library, many of which are within walking distance to residents. The Los Angeles metro area is the second-largest broadcast designated market area in the U.S. (after New York) with 5,431,140 homes (4.956% of the U.S.), which is served by a wide variety of local AM and FM radio and television stations. Los Angeles and New York City are the only two media markets to have seven VHF allocations assigned to them. As part of the region's aforementioned creative industry, the Big Four major broadcast television networks, ABC, CBS, Fox, and NBC, all have production facilities and offices throughout various areas of Los Angeles. All four major broadcast television networks, plus major Spanish-language networks Telemundo and Univision, also own and operate stations that both serve the Los Angeles market and serve as each network's West Coast flagship station: ABC's KABC-TV (Channel 7), CBS's KCBS-TV (Channel 2), Fox's KTTV-TV (Channel 11), NBC's KNBC-TV (Channel 4), MyNetworkTV's KCOP-TV (channel 13), Telemundo's KVEA-TV (Channel 52), and Univision's KMEX-TV (Channel 34). The region also has three PBS stations, as well as KCET, the nation's largest independent public television station. KTBN (Channel 40) is the flagship station of the religious Trinity Broadcasting Network, based out of Santa Ana. A variety of independent television stations, such as KCAL-TV (Channel 9) and KTLA-TV (Channel 5), also operate in the area. 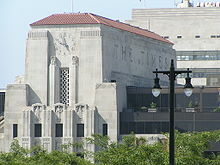 The major daily English-language newspaper in the area is the Los Angeles Times. La Opinión is the city's major daily Spanish-language paper. The Korea Times is the city's major daily Korean language paper while The World Journal is the city and county's major Chinese newspaper. The Los Angeles Sentinel is the city's major African-American weekly paper, boasting the largest African-American readership in the Western United States. Investor's Business Daily is distributed from its LA corporate offices, which are headquartered in Playa del Rey. There are also a number of smaller regional newspapers, alternative weeklies and magazines, including the Los Angeles Register, Los Angeles Community News, (which focuses on coverage of the greater Los Angeles area), Los Angeles Daily News (which focuses coverage on the San Fernando Valley), LA Weekly, L.A. Record (which focuses coverage on the music scene in the Greater Los Angeles Area), Los Angeles Magazine, the Los Angeles Business Journal, the Los Angeles Daily Journal (legal industry paper), The Hollywood Reporter, Variety (both entertainment industry papers), and Los Angeles Downtown News. In addition to the major papers, numerous local periodicals serve immigrant communities in their native languages, including Armenian, English, Korean, Persian, Russian, Chinese, Japanese, Hebrew, and Arabic. Many cities adjacent to Los Angeles also have their own daily newspapers whose coverage and availability overlaps into certain Los Angeles neighborhoods. Examples include The Daily Breeze (serving the South Bay), and The Long Beach Press-Telegram. Los Angeles arts, culture and nightlife news is also covered by a number of local and national online guides like Time Out Los Angeles, Thrillist, Kristin's List, DailyCandy, LAist, and Flavorpill. The city and the rest of the Los Angeles metropolitan area are served by an extensive network of freeways and highways. The Texas Transportation Institute, which publishes an annual Urban Mobility Report, ranked Los Angeles road traffic as the most congested in the United States in 2005 as measured by annual delay per traveler. The average traveler in Los Angeles experienced 72 hours of traffic delay per year according to the study. Los Angeles was followed by San Francisco/Oakland, Washington, D.C. and Atlanta, (each with 60 hours of delay). Despite the congestion in the city, the mean travel time for commuters in Los Angeles is shorter than other major cities, including New York City, Philadelphia and Chicago. Los Angeles's mean travel time for work commutes in 2006 was 29.2 minutes, similar to those of San Francisco and Washington, D.C. Among the major highways that connect LA to the rest of the nation include Interstate 5, which runs south through San Diego to Tijuana in Mexico and north through Sacramento, Portland, and Seattle to the Canada–US border; Interstate 10, the southernmost east–west, coast-to-coast Interstate Highway in the United States, going to Jacksonville, Florida; and U.S. Route 101, which heads to the California Central Coast, San Francisco, the Redwood Empire, and the Oregon and Washington coasts. The LA County Metropolitan Transportation Authority (LA County Metro) and other agencies operate an extensive system of bus lines, as well as subway and light rail lines across Los Angeles County, with a combined monthly ridership (measured in individual boardings) of 38.8 million as of September 2011[update]. The majority of this (30.5 million) is taken up by the city's bus system, the second busiest in the country. The subway and light rail combined average the remaining roughly 8.2 million boardings per month. LA County Metro recorded over 397 million boardings for the 2017 calendar year, including about 285 million bus riders and about 113 million riding on rail transit. For the first quarter of 2018, there were just under 95 million system-wide boardings, down from about 98 million in 2017, and about 105 million in 2016. In 2005, 10.2% of Los Angeles commuters rode some form of public transportation. According to the 2016 American Community Survey, 9.2% of working Los Angeles (city) residents made the journey to work via public transportation. The city's subway system is the ninth busiest in the United States and its light rail system is the country's busiest. The rail system includes the Red and Purple subway lines, as well as the Gold, Blue, Expo, and Green light rail lines. In 2016, the Expo Line was extended to the Pacific at Santa Monica. The Metro Orange and Silver lines are bus rapid transit lines with stops and frequency similar to those of light rail. As of 2018[update], the total number of light rail stations is 93. The city is also central to the commuter rail system Metrolink, which links Los Angeles to all neighboring counties as well as many suburbs. Besides the rail service provided by Metrolink and the Los Angeles County Metropolitan Transportation Authority, Los Angeles is served by inter-city passenger trains from Amtrak. The main rail station in the city is Union Station just north of Downtown. In addition, the city directly contracts for local and commuter bus service through the Los Angeles Department of Transportation, or LADOT. The main international and domestic airport serving Los Angeles is Los Angeles International Airport (IATA: LAX, ICAO: KLAX), commonly referred to by its airport code, LAX. (IATA: ONT, ICAO: KONT) LA/Ontario International Airport, owned by the city of Ontario, CA; serves the Inland Empire. (IATA: BUR, ICAO: KBUR) Hollywood Burbank Airport, jointly owned by the cities of Burbank, Glendale, and Pasadena. Formerly known as Bob Hope Airport and Burbank Airport; the closest airport to Downtown Los Angeles; serves the San Fernando, San Gabriel, and Antelope Valleys. (IATA: LGB, ICAO: KLGB) Long Beach Airport, serves the Long Beach/Harbor area. (IATA: SNA, ICAO: KSNA) John Wayne Airport of Orange County. One of the world's busiest general-aviation airports is also in Los Angeles, Van Nuys Airport (IATA: VNY, ICAO: KVNY). The Vincent Thomas Bridge is at Terminal Island. The Port of Los Angeles is in San Pedro Bay in the San Pedro neighborhood, approximately 20 miles (32 km) south of Downtown. Also called Los Angeles Harbor and WORLDPORT LA, the port complex occupies 7,500 acres (30 km2) of land and water along 43 miles (69 km) of waterfront. It adjoins the separate Port of Long Beach. The sea ports of the Port of Los Angeles and Port of Long Beach together make up the Los Angeles/Long Beach Harbor. Together, both ports are the fifth busiest container port in the world, with a trade volume of over 14.2 million TEU's in 2008. Singly, the Port of Los Angeles is the busiest container port in the United States and the largest cruise ship center on the West Coast of the United States – The Port of Los Angeles's World Cruise Center served about 590,000 passengers in 2014. There are also smaller, non-industrial harbors along Los Angeles's coastline. The port includes four bridges: the Vincent Thomas Bridge, Henry Ford Bridge, Gerald Desmond Bridge, and Commodore Schuyler F. Heim Bridge. Passenger ferry service from San Pedro to the city of Avalon on Santa Catalina Island is provided by Catalina Express. As home to Hollywood and its entertainment industry, numerous singers, actors, celebrities and other entertainers live in various districts of Los Angeles. A sign near City Hall points to the sister cities of Los Angeles. ^ It is popularly believed that the original name was El Pueblo de Nuestra Señora la Reina de los Ángeles de Porciuncula ("The Town of Our Lady the Queen of the Angels of (the River) Porciuncula"), but official documents make it clear that it was not. ^ a b c Gollust, Shelley (April 18, 2013). "Nicknames for Los Angeles". Voice of America. Retrieved June 26, 2014. ^ Barrows, H.D. (1899). "Felepe de Neve". Historical Society of Southern California Quarterly. 4. p. 151ff. Retrieved September 28, 2011. ^ "This 1835 Decree Made the Pueblo of Los Angeles a Ciudad – And California's Capital". KCET. April 2016. Retrieved January 27, 2018. ^ "California Cities by Incorporation Date". California Association of Local Agency Formation Commissions. Archived from the original (DOC) on February 21, 2013. Retrieved August 25, 2014. ^ "About the City Government". City of Los Angeles. Archived from the original on February 8, 2015. Retrieved February 8, 2015. ^ a b c "City Directory". City of Los Angeles. Archived from the original on November 13, 2014. Retrieved September 28, 2014. ^ "2016 U.S. Gazetteer Files". United States Census Bureau. Retrieved June 28, 2017. ^ "Los Angeles City Hall". Geographic Names Information System. United States Geological Survey. Retrieved October 16, 2014. ^ a b "Elevations and Distances". US Geological Survey. April 29, 2005. Retrieved February 10, 2015. ^ "CA Dept. of Finance - New State Population Report" (PDF). Retrieved July 2, 2016. ^ a b "American FactFinder". Retrieved May 25, 2018. ^ "Annual Estimates of the Resident Population: April 1, 2010 to July 1, 2013 – United States – Metropolitan Statistical Area; and for Puerto Rico". United States Census Bureau. Archived from the original on August 15, 2014. Retrieved August 29, 2014. ^ "Annual Estimates of the Resident Population: April 1, 2010 to July 1, 2013 – United States – Combined Statistical Area; and for Puerto Rico". Census Bureau. Census Bureau. Archived from the original on August 15, 2014. Retrieved August 29, 2014. ^ a b Jones, Daniel (2011). Roach, Peter; Setter, Jane; Esling, John (eds.). Cambridge English Pronouncing Dictionary (18th ed.). Cambridge University Press. ISBN 978-0-521-15255-6. ^ "QuickFacts: Los Angeles city, California". United States Census Bureau. Archived from the original on June 27, 2018. Retrieved April 15, 2018. 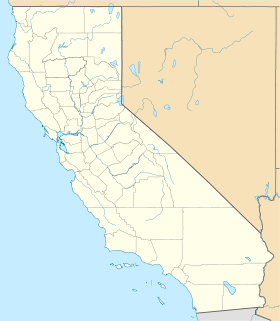 ^ a b "2010 Census U.S. Gazetteer Files – Places – California". United States Census Bureau. ^ "Annual Estimates of the Resident Population: April 1, 2010 to July 1, 2013 – United States – Metropolitan Statistical Area; and for Puerto Rico". United States Census Bureau. ^ "Annual Estimates of the Resident Population: April 1, 2010 to July 1, 2015 – Combined Statistical Area; and for Puerto Rico - 2015 Population Estimates". U.S. Census Bureau. Retrieved April 6, 2016. ^ a b c "Table 3.1. GDP & Personal Income". U.S. Bureau of Economic Analysis. 2018. Retrieved April 6, 2019. ^ "Subterranean L.A.: The Urban Oil Fields | The Getty Iris". blogs.getty.edu. July 16, 2013. Retrieved December 31, 2015. ^ Willard, Charles Dwight (1901). The Herald's History of Los Angeles. Los Angeles: Kingsley-Barnes & Neuner. pp. 21–24. Retrieved September 29, 2011. ^ "Portola Expedition 1769 Diaries". Pacifica Historical Society. Retrieved January 7, 2015. ^ Leffingwell, Randy; Worden, Alastair (November 4, 2005). California missions and presidios. Voyageur Press. pp. 43–44. ISBN 978-0-89658-492-1. Retrieved September 30, 2011. ^ a b "Settlement of Los Angeles". Los Angeles Almanac. Retrieved September 2, 2018. ^ Mulroy, Kevin; Taylor, Quintard; Autry Museum of Western Heritage (March 2001). "The Early African Heritage in California (Forbes, Jack D.)". Seeking El Dorado: African Americans in California. University of Washington Press. p. 79. ISBN 978-0-295-98082-9. Retrieved September 30, 2011. ^ Guinn, James Miller (1902). Historical and biographical record of southern California: containing a history of southern California from its earliest settlement to the opening year of the twentieth century. Chapman pub. co. p. 63. Retrieved September 30, 2011. ^ Estrada, William D. (2006). Los Angeles's Olvera Street. Arcadia Publishing. ISBN 978-0-7385-3105-2. Retrieved September 30, 2011. ^ "Pio Pico, Afro Mexican Governor of Mexican California". African American Registry. Archived from the original on February 2, 2017. Retrieved January 24, 2017. ^ Guinn, James Miller (1902). Historical and biographical record of southern California: containing a history of southern California from its earliest settlement to the opening year of the twentieth century. Chapman pub. co. p. 50. Retrieved September 30, 2011. ^ Mulholland, Catherine (2002). William Mulholland and the Rise of Los Angeles. University of California Press. p. 15. ISBN 978-0-520-23466-6. Retrieved September 30, 2011. ^ Kipen, David (2011). Los Angeles in the 1930s: The WPA Guide to the City of Angels. University of California Press. pp. 45–46. ISBN 978-0-520-26883-8. Retrieved September 30, 2011. ^ "Population of the 100 Largest Urban Places: 1900". United States Census Bureau. June 15, 1998. Retrieved January 8, 2015. ^ "The Los Angeles Aqueduct and the Owens and Mono Lakes (MONO Case)". American University. Archived from the original on January 9, 2015. Retrieved January 8, 2015. ^ Reisner, Marc (1993). Cadillac desert: the American West and its disappearing water. Penguin. p. 86. ISBN 978-0-14-017824-1. Retrieved September 30, 2011. ^ Annexation and Detachment Map (PDF) (Map). City of Los Angeles Bureau of Engineering. ^ Creason, Glen (September 26, 2013). "CityDig: L.A.'s 20th Century Land Grab". Los Angeles Magazine. Retrieved October 10, 2013. ^ Weiss, Marc A (1987). The Rise of the Community Builders: The American Real Estate Industry and Urban Land Planning. New York: Columbia University Press. pp. 80–86. ISBN 978-0-231-06505-4. ^ Buntin, John (April 6, 2010). L.A. Noir: The Struggle for the Soul of America's Most Seductive City. Random House Digital, Inc. p. 18. ISBN 978-0-307-35208-8. Retrieved September 30, 2011. ^ Young, William H.; Young, Nancy K. (March 2007). The Great Depression in America: a cultural encyclopedia. Greenwood Publishing Group. p. 21. ISBN 978-0-313-33521-1. Retrieved September 30, 2011. ^ "Population of the 100 Largest Urban Places: 1930". United States Census Bureau. June 15, 1998. Retrieved January 8, 2015. ^ Parker, Dana T. Building Victory: Aircraft Manufacturing in the Los Angeles Area in World War II, pp.5–8, 14, 26, 36, 50, 60, 78, 94, 108, 122, Cypress, CA, 2013. ISBN 978-0-9897906-0-4. ^ Bruegmann, Robert (November 1, 2006). Sprawl: A Compact History. University of Chicago Press. p. 133. ISBN 978-0-226-07691-1. Retrieved October 1, 2011. ^ Hafner, Katie; Lyon, Matthew (August 1, 1999). Where Wizards Stay Up Late: The Origins Of The Internet. Simon and Schuster. p. 153. ISBN 978-0-684-87216-2. Retrieved October 1, 2011. ^ Woo, Elaine (June 30, 2004). "Rodney W. Rood, 88; Played Key Role in 1984 Olympics, Built Support for Metro Rail". Los Angeles Times. Retrieved October 1, 2011. ^ Zarnowski, C. Frank (Summer 1992). "A Look at Olympic Costs" (PDF). Citius, Altius, Fortius. 1 (1): 16–32. Archived from the original (PDF) on May 28, 2008. Retrieved October 1, 2011. ^ Rucker, Walter C.; Upton, James N.; Hughey, Matthew W. (2007). "Los Angeles (California) Riots of 1992". Encyclopedia of American race riots. Greenwood Publishing Group. pp. 376–85. ISBN 978-0-313-33301-9. Retrieved October 1, 2011. ^ Wilson, Stan (April 25, 2012). "Riot anniversary tour surveys progress and economic challenges in Los Angeles". CNN. Retrieved January 23, 2015. ^ Reich, Kenneth (December 20, 1995). "Study Raises Northridge Quake Death Toll to 72". Los Angeles Times. p. B1. Retrieved October 1, 2011. ^ "Rampart Scandal Timeline". PBS Frontline. Retrieved October 1, 2011. ^ Orlov, Rick (November 3, 2012). "Secession drive changed San Fernando Valley, Los Angeles". Los Angeles Daily News. Retrieved January 12, 2015. ^ Horowitz, Julia (August 1, 2017). "Los Angeles will host 2028 Olympics". CNNMoney. Archived from the original on July 31, 2017. ^ "Cities Which Have Hosted Multiple Summer Olympic Games". worldatlas. Archived from the original on December 15, 2016. ^ "Elevations of the 50 Largest Cities (by population, 1980 Census)". United States Geological Survey. Archived from the original on October 2, 2011. Retrieved October 3, 2011. ^ "Mount Lukens Guide". Sierra Club Angeles Chapter. Retrieved October 3, 2011. ^ Gumprecht, Blake (March 2001). The Los Angeles River: Its Life, Death, and Possible Rebirth. JHU Press. p. 173. ISBN 978-0-8018-6642-5. Retrieved October 3, 2011. ^ Miller, George Oxford (January 15, 2008). Landscaping with Native Plants of Southern California. Voyageur Press. p. 15. ISBN 978-0-7603-2967-2. Retrieved October 6, 2011. ^ National Research Council (U.S.). Advisory Committee on Technology Innovation (1979). Tropical legumes: resources for the future : report of an ad hoc panel of the Advisory Committee on Technology Innovation, Board on Science and Technology for International Development, Commission on International Relations, National Research Council. National Academies. p. 258. NAP:14318. Retrieved October 6, 2011. ^ "Flower". Los Angeles Magazine. Emmis Communications. April 2003. p. 62. ISSN 1522-9149. Retrieved October 6, 2011. ^ "Earthquake Facts". United States Geological Survey. Retrieved October 3, 2011. ^ "San Andreas Fault Set for the Big One". Physorg.com. June 21, 2006. Retrieved October 3, 2011. ^ Shaw, John H.; Shearer, Peter M. (March 5, 1999). "An Elusive Blind-Thrust Fault Beneath Metropolitan Los Angeles". Science. 283 (5407): 1516–1518. Bibcode:1999Sci...283.1516S. doi:10.1126/science.283.5407.1516. PMID 10066170. ^ "World's Largest Recorded Earthquake". Geology.com. Retrieved January 12, 2015. ^ Pool, Bob (February 19, 2009). "L.A. neighborhoods, you're on the map". Los Angeles Times. Retrieved October 2, 2011. ^ Abu-Lughod, Janet L. (1999). New York, Chicago, Los Angeles: America's global cities. U of Minnesota Press. p. 66. ISBN 978-0-8166-3336-4. Retrieved October 2, 2011. ^ "Los Angeles tops worst cities for traffic in USA". USA TODAY. Retrieved December 31, 2015. ^ Peel, M. C.; Finlayson B. L. & McMahon, T. A. (2007). "Updated world map of the Köppen−Geiger climate classification". Hydrol. Earth Syst. Sci. 11 (5): 1633–1644. doi:10.5194/hess-11-1633-2007. ISSN 1027-5606. ^ "The Myth of a Desert Metropolis: Los Angeles was not built in a desert, but are we making it one?". Boom California. May 22, 2017. Retrieved March 8, 2019. ^ "Interactive North America Koppen-Geiger Climate Classification Map". www.plantmaps.com. Retrieved March 8, 2019. ^ a b "Historical Weather for Los Angeles, California, United States of America". Weatherbase.com. Retrieved December 15, 2011. ^ a b c d e f g h i "Climatography of the United States No. 20 (1971–2000)" (PDF). National Oceanic and Atmospheric Administration. 2004. Archived from the original (PDF) on September 2, 2013. Retrieved October 5, 2011. ^ "Pacific Ocean Temperatures on California Coast". beachcalifornia.com. Retrieved October 5, 2011. ^ "Los Angeles Climate Guide". weather2travel.com. Retrieved October 5, 2011. ^ "Climate of California". Western Regional Climate Center. Retrieved October 6, 2011. ^ Poole, Matthew R. (September 22, 2010). Frommer's Los Angeles 2011. John Wiley & Sons. p. 22. ISBN 978-0-470-62619-1. Retrieved October 5, 2011. ^ Burt, Christopher C.; Stroud, Mark (June 26, 2007). Extreme weather: a guide & record book. W. W. Norton & Company. p. 100. ISBN 978-0-393-33015-1. Retrieved October 5, 2011. ^ Frazin, Rachel (February 21, 2019). "Los Angeles sees first snow in years". thehill.com. Capitol Hill Publishing Corp. Retrieved April 6, 2019. ^ "Snow falling in Los Angeles, Pasadena and California's coastal cities". nbcnews.com. NBC Universal. February 22, 2019. Retrieved April 6, 2019. ^ Pool, Bob; Lin II, Rong-Gong (September 27, 2010). "L.A.'s hottest day ever". Los Angeles Times. Retrieved October 5, 2011. ^ a b "NowData – NOAA Online Weather Data". National Oceanic and Atmospheric Administration. Retrieved June 7, 2013. ^ "Station Name: CA LOS ANGELES DWTN USC CAMPUS". National Oceanic and Atmospheric Administration. Retrieved May 9, 2014. ^ "LOS ANGELES/WBO CA Climate Normals". National Oceanic and Atmospheric Administration. Retrieved October 20, 2013. ^ "Station Name: CA LOS ANGELES INTL AP". National Oceanic and Atmospheric Administration. Retrieved May 9, 2014. ^ "WMO Climate Normals for LOS ANGELES/INTL, CA 1961–1990". National Oceanic and Atmospheric Administration. Retrieved April 17, 2014. ^ "PRISM Climate Group, Oregon State U". prism.oregonstate.edu. Retrieved March 28, 2019. ^ Bowman, Chris (July 8, 2008). "Smoke is Normal – for 1800". The Sacramento Bee. Archived from the original on July 9, 2008. Retrieved October 6, 2011. ^ Gordon J. MacDonald. "Environment: Evolution of a Concept" (PDF). p. 2. The Native American name for Los Angeles was Yang na, which translates into "the valley of smoke." ^ Stimson, Thomas E. (July 1955). What can we do about smog?. Popular Mechanics. p. 65. ISSN 0032-4558. Retrieved October 6, 2011. ^ Smog Hangs Over Olympic Athletes. New Scientist. August 11, 1983. p. 393. ISSN 0262-4079. Retrieved October 6, 2011. ^ “Early Implementation of the Clean Air Act of 1970 in California.” EPA Alumni Association. Video, Transcript (see p7,10). July 12, 2016. ^ Marziali, Carl (March 4, 2015). "L.A.'s Environmental Success Story: Cleaner Air, Healthier Kids". USC News. Retrieved March 16, 2015. ^ "Most Polluted Cities". American Lung Association. Retrieved January 12, 2015. ^ "Pittsburgh and Los Angeles the most polluted US cities". citymayors.com. May 4, 2008. Retrieved October 7, 2011. ^ "Los Angeles meets 20 percent renewable energy goal". Bloomberg News. January 14, 2011. Archived from the original on February 1, 2011. Retrieved October 7, 2011. ^ "American Lung Association State of the Air 2013 – Los Angeles-Long Beach-Riverside, CA". American Lung Association State of the Air 2013. Retrieved September 1, 2015. ^ "EPA officers sickened by fumes at South L.A. oil field". latimes.com. Retrieved March 24, 2016. ^ "2010 Census Interactive Population Search: CA — Los Angeles". United States Census Bureau. Archived from the original on July 24, 2014. Retrieved July 12, 2014. ^ a b c d e f g h "Los Angeles (city), California". United States Census Bureau. Retrieved October 3, 2016. ^ a b c d e "Race and Hispanic Origin for Selected Cities and Other Places: Earliest Census to 1990". United States Census Bureau. Archived from the original on August 6, 2012. Retrieved November 6, 2015. ^ Hispanic origin based on the White population of Spanish mother tongue. ^ Ray, MaryEllen Bell (1985). The City of Watts, California: 1907 to 1926. ISBN 978-0-917047-01-5. ^ Pomfret, John (April 2, 2006). "Cardinal Puts Church in Fight for Immigration Rights". Washington Post. Retrieved October 22, 2011. ^ Stammer, Larry B.; Becerra, Hector (September 4, 2002). "Pomp Past, Masses Flock to Cathedral". Los Angeles Times. Retrieved October 22, 2011. ^ Dellinger, Robert (September 6, 2011). "2011 'Grand Procession' revives founding of L.A. Marian devotion" (PDF). The Tidings Online. Retrieved January 14, 2015. ^ "World Jewish Population". SimpleToRemember.com. Retrieved October 23, 2011. ^ "Washington Symposium and Exhibition Highlight Restoration and Adaptive Reuse of American Synagogues". Jewish Heritage Report (1). March 1997. Retrieved October 23, 2011. ^ "Los Angeles's Breed Street Shul Saved by Politicians". Jewish Heritage Report. II (1–2). Spring–Summer 1998. Retrieved October 23, 2011. ^ Luscombe, Belinda (August 6, 2006). "Madonna Finds A Cause". Time Magazine. Retrieved October 23, 2011. ^ a b c Clifton L. Holland. "n Overview of Religion in Los Angeles from 1850 to 1930". ^ "History of the Metropolitan Community Church". ^ "LDS Los Angeles California Temple". The Church of Jesus Christ of Latter-day Saints. Retrieved October 23, 2011. ^ "Church of Scientology Celebrity Centre International". Church of Scientology Celebrity Centre International. Retrieved June 17, 2018. ^ "The Global Financial Centres Index 21" (PDF). Long Finance. March 2017. Archived from the original (PDF) on June 11, 2017. ^ Slide, Anthony (February 25, 2014). The New Historical Dictionary of the American Film Industry. Routledge. ISBN 9781135925543. ^ a b "Los Angeles: Economy". City-Data. Retrieved October 7, 2011. ^ "The World According to GaWC 2012". Globalization and World Cities Research Network. Loughborough University. Retrieved January 25, 2014. ^ "City of Los Angeles CAFR (2010)" (PDF). City of Los Angeles. p. 332 (367). Retrieved October 14, 2011. ^ George, Evan (December 11, 2006). "Trojan Dollars: Study Finds USC Worth $4 Billion Annually to L.A. County". Los Angeles Downtown News. Archived from the original on April 30, 2009. ^ "Fortune 500 Companies 2018: Who Made The List". Fortune. Meredith Corporation. Retrieved April 13, 2015. ^ "Is Los Angeles really the creative capital of the world? Report says yes". SmartPlanet. November 19, 2009. Retrieved October 14, 2011. ^ a b "Only In LA: Tapping L.A. Innovation". University of Southern California. Archived from the original on October 2, 2011. Retrieved October 14, 2011. ^ Waxman, Sharon (January 31, 2006). "At U.S.C., a Practical Emphasis in Film". The New York Times. Retrieved October 14, 2011. ^ "Explore the Center". Music Center of Los Angeles County. Archived from the original on October 5, 2011. Retrieved October 14, 2011. ^ "Overview". Los Angeles County Museum of Art. Retrieved October 20, 2011. ^ Boehm, Mike (March 16, 2009). "Getty slashes operating budget after severe investment losses". Los Angeles Times. Retrieved October 20, 2011. ^ Mather, Kate (August 5, 2011). "Downtown L.A. Art Walk safety changes planned". Los Angeles Times. Retrieved October 20, 2011. ^ "Rams to Return to Los Angeles". St. Louis Rams. January 12, 2016. Archived from the original on January 20, 2016. Retrieved January 13, 2016. ^ Maske, Mark (January 12, 2016). "NFL returns to Los Angeles: Owners approve move by Rams; Chargers with option to join". The Washington Post. Retrieved January 12, 2016. ^ NAGOURNEY, Adam; LONGMAN, JERÉ (July 31, 2017). "Los Angeles Makes Deal to Host the 2028 Summer Olympics". The New York Times. Archived from the original on August 2, 2017. ^ "Games – Deaflympics". deaflympics.com. ^ "Los Angeles To Host 2015 Special Olympics World Summer Games". Special Olympics. September 14, 2011. Retrieved February 9, 2012. ^ "Los Angeles, California Code Resources". American Legal Publishing. Archived from the original on January 23, 2015. Retrieved January 23, 2015. ^ "Communities of Interest — City". California Citizens Redistricting Commission. Archived from the original on October 23, 2015. Retrieved September 28, 2014. ^ "Communities of Interest — City". California Citizens Redistricting Commission. Archived from the original on September 30, 2013. Retrieved September 27, 2014. ^ Powell, Amy (January 6, 2010). "Los Angeles crime rates hit 50-year lows". KABC-TV. Archived from the original on July 21, 2015. Retrieved January 14, 2015. ^ "LAPD year-end crime statistics". Los Angeles Police Department. Retrieved April 13, 2010. ^ "Uniform Crime Reports of Los Angelesand Index from 1985 to 2005". Retrieved April 20, 2016. ^ "LAPD Online Crime Rates" (PDF). Los Angeles Police Department. Retrieved April 13, 2010. ^ "Simmons, Randal". Los Angeles Police Department. Retrieved July 9, 2008. ^ "LAPD City Murder Rate Drops 16 Percent". KCBS-TV. January 6, 2014. Retrieved February 4, 2014. ^ a b DeVico, Peter (2007). The Mafia Made Easy: The Anatomy and Culture of La Cosa Nostra. Tate Publishing. p. 154. ISBN 978-1-60247-254-9. Retrieved September 6, 2012. ^ "Gangs". Los Angeles Police Department. Retrieved April 13, 2010. ^ Serjeant, Jill (February 8, 2007). "Police target 11 worst Los Angeles street gangs". Reuters. Retrieved January 14, 2015. ^ "US Census, District information". United States Census Bureau. Archived from the original on December 25, 2008. Retrieved October 24, 2011. ^ "Los Angeles Public Library Branches". Los Angeles Public Library. Retrieved October 24, 2011. ^ "Allocation". Museum of Broadcast Communications. Retrieved October 20, 2011. ^ "Flavorpill". Archived from the original on February 7, 2013. Retrieved September 1, 2015. ^ Woolsey, Matt (April 25, 2008). "Best And Worst Cities For Commuters". Forbes. Retrieved October 24, 2011. ^ Woolsey, Matt. "In Depth: 10 Worst Cities For Commuters". Forbes. Retrieved October 24, 2011. ^ a b "Ridership Statistics". Los Angeles County Metropolitan Transportation Authority. Retrieved October 24, 2011. ^ "Interactive Estimated Ridership Stats: Calendar Year, 2017". Los Angeles County Metro Transit Authority. Retrieved May 6, 2018. ^ "Interactive Estimated Ridership Stats: Year over Year, 2018". Los Angeles County Metro Transit Authority. Retrieved May 6, 2018. ^ Christie, Les (June 29, 2007). "New Yorkers are Top Transit Users". CNN. Retrieved October 24, 2011. ^ "Public Transit Ridership Report" (PDF). American Public Transportation Association. 2011. Retrieved October 24, 2011. ^ "Van Nuys Airport General Description". Los Angeles World Airports. Retrieved October 25, 2011. ^ "Los Angeles/Long Beach Harbor Safety Committee" (PDF). Archived from the original (PDF) on October 8, 2006. Retrieved March 16, 2011. ^ "Los Angeles/Long Beach Harbor Employers Association". Harboremployers.com. Retrieved March 16, 2011. ^ "AAPA World Port Rankings 2008" (PDF). Retrieved March 16, 2011. ^ "Cruise Passenger and Ferry Terminals". Port of Los Angeles. Retrieved January 14, 2015. ^ "Sister Cities of Los Angeles". Sister Cities Los Angeles. Retrieved February 25, 2019. ^ "Bordeaux– Rayonnement européen et mondial". Mairie de Bordeaux (in French). Archived from the original on February 7, 2013. Retrieved July 29, 2013. ^ "Bordeaux-Atlas français de la coopération décentralisée et des autres actions extérieures". Délégation pour l'Action Extérieure des Collectivités Territoriales (Ministère des Affaires étrangères) (in French). Archived from the original on February 7, 2013. Retrieved July 29, 2013. ^ "Berlin City Partnerships". Der Regierende Bürgermeister Berlin. Archived from the original on May 21, 2013. Retrieved September 17, 2013. ^ "Guangzhou Sister Cities". Guangzhou Foreign Affairs Office. Archived from the original on October 24, 2012. Retrieved July 21, 2013. ^ "Vancouver Twinning Relationships" (PDF). City of Vancouver. Retrieved December 5, 2009. ^ "Gradovi prijatelji Splita" [Split Twin Towns]. Grad Split [Split Official City Website] (in Croatian). Archived from the original on March 24, 2012. Retrieved December 19, 2013. ^ "Yerevan Twin Towns & Sister Cities". Yerevan Municipality Official Website. Retrieved November 4, 2013. ^ "Twinning link with LA". Manchester Evening News. July 27, 2009. Archived from the original on July 31, 2013. Retrieved July 28, 2009. ^ "Tel Aviv/Los Angeles Partnership". The Jewish Federation of Greater Los Angeles. 2007. Archived from the original on June 23, 2008. Retrieved August 7, 2008. Carey McWilliams (2009). Southern California: An Island on the Land (9th ed.). Peregrine Smith. ISBN 978-0-87905-007-8. Richard White (1991). It's Your Misfortune and None of My Own: A New History of the American West. University of Oklahoma Press. ISBN 978-0-8061-2567-1. David Rieff (1992). Los Angeles: Capital of the Third World. Touchstone. ISBN 978-0-671-79210-7. Peter Theroux (1994). Translating LA: A Tour of the Rainbow City. Norton. ISBN 978-0-393-31394-9. Paul Glover (1995). Los Angeles: A History of the Future. Greenplanners. ISBN 978-0-9622911-0-4. Leonard Pitt & Dale Pitt (2000). Los Angeles A to Z: An Encyclopedia of the City and County. Berkeley: University of California Press. ISBN 978-0-520-20530-7. Kevin Starr and David Ulin (2009). Jim Heimann (ed.). Los Angeles: Portrait of a City. Taschen America. ISBN 978-3-8365-0291-7. Reyner Banham (2009). Los Angeles: The Architecture of Four Ecologies (2nd ed.). Berkeley: University of California Press. ISBN 978-0-520-26015-3. Mike Davis (2006). City of Quartz: Excavating the Future in Los Angeles. Verso. ISBN 978-1-84467-568-5. Robert M. Fogelson (1993). The Fragmented Metropolis: Los Angeles 1850–1930. Berkeley: University of California Press. ISBN 978-0-520-08230-4. Norman M. Klein (1997). The History of Forgetting: Los Angeles and the Erasure of Memory. Verso. ISBN 978-1-84467-242-4. Sam Hall Kaplan (2000). L.A. Lost & Found: An Architectural History of Los Angeles. Hennessey and Ingalls. ISBN 978-0-940512-23-8. Wim de Wit and Christopher James Alexander (2013). Overdrive: L.A. Constructs the Future, 1940–1990. Getty Publications. ISBN 978-1-60606-128-2. Acuña, Rodolfo (1996). Anything but Mexican: Chicanos in contemporary Los Angeles. Verso. ISBN 978-1-85984-031-3. Retrieved September 30, 2011. George, Lynell (1992). No Crystal Stair: African Americans in the City of Angels. Verso. ISBN 978-0-86091-389-4. Sides, Josh (2006). L.A. City Limits: African American Los Angeles from the Great Depression to the Present. Berkeley: University of California Press. ISBN 978-0-520-24830-4. Eduardo Obregón Pagán (2006). Murder at the Sleepy Lagoon: Zoot Suits, Race, and Riot in Wartime L.A. The University of North Carolina Press. ISBN 978-0-8078-5494-5. R. J. Smith (2007). The Great Black Way: L.A. in the 1940s and the Last African American Renaissance. PublicAffairs. ISBN 978-1-58648-521-4. Lillian Faderman and Stuart Timmons (2006). Gay L. A.: A History of Sexual Outlaws, Power Politics, And Lipstick Lesbians. Basic Books. ISBN 978-0-465-02288-5. Hurewitz, Daniel (2007). Bohemian Los Angeles: and the Making of Modern Politics. Berkeley: University of California Press. ISBN 978-0-520-24925-7. Marc Reisner (1986). Cadillac Desert: The American West and its Disappearing Water. Penguin Books. ISBN 978-0-14-017824-1. Chip Jacobs and William Kelly (2008). Smogtown: The Lung-Burning History of Pollution in Los Angeles. Outlook Hardcover. ISBN 978-1-58567-860-0. David L. Ulin, ed. (2002). Writing Los Angeles: A Literary Anthology. Library of America. ISBN 978-1-931082-27-3. Whiting, Cécile (2008). Pop L.A.: Art and the City in the 1960s. Berkeley: University of California Press. ISBN 978-0-520-25634-7. This page was last edited on 24 April 2019, at 13:06 (UTC).